What is the scientific basis for green tea weight loss? What are the misleading marketing claims to watch out for? This article covers the science aspect i.e. important facts you must know about green tea weight loss. During spring 2007, my friend and customer Ellen told me that drinking green tea has helped her shed 25 pounds in 6 months. Doesn’t that sound too easy? Or was it just a one off success? I was skeptical at first. So I delved into it, reading all the scientific studies that I could lay my hands on. Here are my findings. Enjoy. "Drinking tea for a long time makes one thin," says ancient Chinese medicinal classic Bencao Shiyi. Fast forward 1,300 years, and that is exactly what scientists have found today. For those of you who are skeptical, I highly recommend you read Swen Wolfram's excellent review paper Anti-obesity effects of green tea. In his peer review of 74 studies, he concluded that weight loss due to green tea consumption has been demonstrated in laboratory studies involving cell culture and animals. According to Dr. Wolfram, 9 human studies have been conducted, with "most of these studies reporting decreased body weight and fat mass." There is still a need for well-designed human studies to better understand the underlying mechanisms, but there is no question that it works! What is wrong with conventional dieting? When you go on a diet and starve, your body's survival instinct is triggered and you automatically go on "energy saving" mode. This reduces your metabolism and makes you burn fewer calories. In addition, your body begins to feed on itself. Although some fat may be used as energy, the most readily available source is protein i.e. muscle. This causes the familiar yo-yo phenomenon, where you not only regain the lost weight, but rebound to even higher weight than what you started with. You may see your weight going down on a scale, but actually you are losing muscle, not fat. Your natural metabolism rate is largely determined by the amount of muscle you carry. Most diets fail because they help you lose the wrong kind of weight! Why Does A Green Tea Diet Work? Green tea weight loss works because it does not require you to eat a very low calorie diet. Block conversion of energy into fat. Help your body absorb less dietary fat. Regulate your blood sugar levels and reduce food cravings. Some green tea fat burner products claim that they can help to suppress your appetite. This is highly misleading. Therefore, for green tea to act as an appetite suppressant, you would have to either drink green tea constantly or consume tea extract at much higher levels than what is found in the market today. Beware of companies making misleading claims on green tea's appetite suppressing effect. Some weight loss products can make you feel less hungry because they contain chromium, not because of the green tea extract. Burns calories. Your burn extra calories when you engage in physical activities. Boosts metabolism. Your energy level stays high for a period of time after you finish exercising. Increases muscle mass. When you exercise, you develop lean muscle mass. Your metabolism rate is determined largely by how much muscle you carry. So having more muscle makes it easier for you to keep slim. Getting into an exercise routine is hard work. The good news is that drinking green tea can increase your endurance level by up to 24%. Researchers found that mice that exercised regularly lost 24% of additional weight gain introduced by a high fat diet. Mice that drank green tea lost 47%. Mice that exercised AND drank green tea lost 89%! It was found that mice that exercised and drank green tea burned the most energy and fat even when they were resting. Mice that drank green tea also burned more fat during exercise. Surprisingly, the study found that drinking green tea alone helps lose more fat and weight than exercising alone would for mice. Water, Muscle or Fat Loss? The American College of Sports Medicine (ACSM), the largest and most respected health, medical and exercise organization in the world, has established guidelines for healthy weight loss. They recommend a weight loss goal of one to two pounds per week. According to Tom Venuto, author of the excellent book Burn the Fat, it is possible to lose more than two pounds per week, but if you do, most of the additional weight will usually be water and muscle. When you lose water weight, you will gain it back immediately as soon as you rehydrate yourself. When you lose muscle, your metabolic rate slows down, making you more likely to regain the lost weight later. Green tea weight loss is no exception! Permanent weight loss is slow because it involves fat loss, not water or muscle loss. And green tea is proficient in promoting fat burning. Lose Weight Fast? How Soon Can You See Results? Don't let anyone fool you into thinking that green tea acts fast! Studies by Dulloo and Rumpler used a state-of-the-art metabolic chamber to measure the energy expenditure of their study subjects over 24 hours. They found that green tea increases metabolism by 2.9% and 4% and fat burning by 12% and 35% respectively. If you burn 2,000 calories a day, this translates to a savings of up to 80 calories, or 8 pounds a year, not bad for just a few cups of soothing tea! After a few years, each little cup adds up to a gigantic slimming effect. How quickly you lose weight depends on your diet and lifestyle. No one can guarantee how many pounds you can shed in a week! More green tea will help you lose more weight, but only up to a certain amount. So far scientists have not found evidence that consuming a lot more green tea will help you lose a lot more weight (i.e. dose-dependent relationship is not well established). 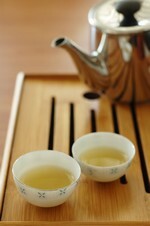 However, there is emerging evidence that the amount of time during which you drink green tea is important. The longer you drink it, the more fat it burns. A Taiwanese population study found that 140 people who were regular tea drinkers for more than 10 years had 20% body fat. This is significantly lower than the non tea drinkers with 25% body fat. In other words, develop the good habit of drinking high quality green tea, and you will stand a much better chance of staying healthy and slim in the years to come. After you have successfully regained your curvy shape, what comes next? The beauty of green tea is that, unlike other herbs and supplements, you can drink 3 to 6 cups daily for the rest of your life without having any side effects. Together with its other powerful health benefits, this means green tea is an ideal weight maintenance beverage. A study conducted by Mastic University in United States found that green tea extract consisting mainly of epigallocatechin gallate (EGCG) and caffeine can limit initial weight loss to 5% to 10%. Green tea contains less caffeine. A widely accepted rule of thumb is that it contains half the amount of caffeine found in coffee. Green tea also contains a natural relaxant called theanine, which is known to promote a feeling of well-being. If you are at work, it will improve your concentration and productivity. But there is a catch. Although you will reap the many health benefits of green tea, you will lose less weight than a low caffeine consumer. In the same study quoted above, participants maintained their weight by drinking a caffeinated green tea (consisting of 270 milligrams of EGCG and 150 milligrams of caffeine). High caffeine consumers did not benefit from the green tea. But low caffeine consumers continued to lose weight in the weight maintenance phase through higher metabolism and fat burning. So by all means drink more green tea for its health and fat burning effect, but have a more realistic expectation of what it will do for you in term of weight loss! Green Tea Diet - How To Be A Successful Loser. Does Tea Weight Loss Work? Green tea fat metabolism includes visceral fat burning. This is a harmful type of fat that produces the apple body shape and is linked to type 2 diabetes.